A British satellite called Strand-1 that launches this month will be entirely controlled by a Google Nexus One smartphone. 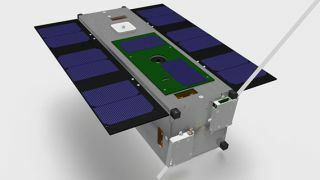 The box-shaped satellite, or "CubeSat", will spend six months in orbit being monitored by the team that developed it at the Surrey Space Centre (SSC) and Surrey Satellite Technology Limited (SSTL). Talking to BBC News, SSC's lead engineer Dr Chris Bridges said the Nexus One is an off-the-shelf model: "We haven't gutted the Nexus. We've done lots and lots of tests on it; we've put our own software on it. But we've essentially got a regular phone, connected up the USB to it and put it in the satellite". The Nexus One is positioned on one side of the 30cm long, 4.3kg satellite, allowing its 5MP camera to get a good look out at the Earth and Moon. To start with, the satellite will use an onboard Linux-based computer to test two new propulsion systems. These are the sci-fi-sounding pulsed "plasma thrusters" and "Warp Drive" (Water Alcohol Resisto-jet Propulsion De-orbit Re-entry Velocity Experiment). After that's done, full control of the satellite will be handed over to the Nexus One. A camera inside will relay telemetry from the Nexus One's screen and an experiment using its inbuilt magnetometer will also be conducted. SSTL's head of science, Doug Liddle, says that although we probably won't be seeing any US$30 smartphone-controlled satellites any time soon, the possibilities are exciting: "instead of having a small, niche group of spacecraft flight-software developers, you could suddenly call on a global community of app developers to help you design control or telemetry-handling systems for spacecraft." Even though Strand-1 hasn't yet broken free of Earth's gravity, Strand-2 is already in the works. Using yet more consumer tech, two of the boxy cubesats will float around in space before using Microsoft's Xbox Kinect to find one another and dock. While playing Strauss' The Blue Danube, we hope.